Non-enveloped, twinned (geminate) incomplete T=1 icosahedral symmetry capsid that contains 22 pentameric capsomers made of 110 capsid proteins (CP). Each geminate particle contains only a single circular ssDNA. Monopartite, circular, ssDNA genome (+) genome of about 2.7 kb. 3' terminus has no poly(A) tract. There are coding regions in both the virion (positive) and complementary (negative) sense strands. The genome is replicated through double-stranded intermediates. The replication (Rep) protein initiates and terminates rolling circle replication, the host DNA polymerase being used for DNA replication itself. There is a potential stem-loop structure in the intergenic region where ssDNA synthesis is initiated. Transcription is bidirectional from the intergenic region. 7 proteins are produced. On the v-sense: proteins CP, V2, V3 and V4. On the C-sense: Rep, Rep-A and C3. Proteins are expressed from subgenomic RNAs (sgRNAs). Replication is initiated by cleavage of the(+)strand by REP, and occurs by rolling circle producing ssDNA genomes. 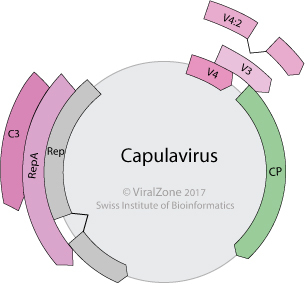 c) be transported outside the nucleus, to a neighboring cell through plasmodesmata (cell-cell movement) with the help of viral movement proteins.